Over the last year or so, we have focused on the customer journey map as an optimization point to impact the decision making process and increase Amazon sales. Huh? Yes, I heard you pause and think what is he talking about! Effectively establishing a brand requires an off-Amazon presence and strategy. Over 212 million items are purchased monthly by Pinterest users after seeing the item on Pinterest. Youtube receives over 30 million visitors every day. The traditional Sales funnel begins with the first contact with a customer. Unless you have a unique product or a unique selling proposition, Amazon seems more competitive than in the past. In this article, we are not talking about pencils; we are talking about items where the features and benefits between manufacturers can be more than minute differences. In terms of customer relationship management, the customer lifecycle describes the various stages a consumer goes through before, during and after they complete a transaction. Simply put, it’s the Point A to Point B journey a customer takes until they make the final purchase. The customer journey map is a part of the lifecycle itself. It tells the story of the customer's experience: from initial contact, through the process of engagement and into a long-term relationship identifying along the way the different touch points and engagement opportunities the brand should focus on. It may focus on a particular part of the story or give an overview of the entire experience. Broken down, after defining multiple personas, you walk the mile in their shoes. The changes examined today do not apply to all products. Each product should be evaluated to determine the best path to follow. Our focus, as well as voices in the marketing community, are revealing noticeable changes to the traditional customer journey. These changes to their process of discovery and evaluation, if applicable to your products, should change how you structure your sales funnel including where you place your marketing emphasis. This article examines those changes in customer behavior, the effects it has on their journey and how you should consider changing your marketing approach to impact and influence buying decisions. Do not just shrug this off and overlook changes in behavior. All you have to do is look at the current state of brick and mortar retail to see the devastation that not adjusting to changes in buyer behavior can have on a sector. The marketing sales funnel does not make up the entire customer journey. The funnel is a part of the larger customer lifecycle. The customer journey begins long before they enter your specific funnel. We are seeing a change in the customer journey and decision-making process that is making the traditional funnel outdated depending on the product. Currently, the marketing money to support the stages of that funnel are focused on getting them into the funnel and at the sale point to encourage the conversion. Consumers are becoming savvier, and the information age, at their fingertips is what has enlightened them. There is proof that the average consumer has 6 to 8 touch points with a brand before making a purchase. They are doing more research before making a purchase. This is the beginning of the customer journey. We are bombarded with ads, brands, advertising, everywhere you look, it is impossible to not see. How is anyone supposed to stand out and get noticed? How is anyone to figure out which product is better, which brand is best for their purpose? I am not a shopper. do not watch TV or listen to the radio much. I am off of the grid in that sense. How is any brand supposed to market to me? I do read an enormous amount daily and consume huge amounts of data in the process. I do and I will use products recommended by or in use by people that I know and trust. Success in today's' competitive markets is a multi-platform, multi-channel strategy that involves many little nuances and the acknowledgement from past and current users is a vehicle that adds tremendous reach for any of those strategies. For example, Tom is on the market for a new laptop. He is at the consideration stage where he is trying to get a grip on the general features that he wants and needs. One of the computer guys at work has his new laptop today and is raving about the features, the bells, and whistles along with how he found all of this helpful info on the company website to help him set it up correctly. He, himself, is past the sale, at the last stage, which we will cover later. Tom, armed with the info and advice from his coworker, goes home, taking his coworkers advice, starts looking at the laptop online. He compares laptops, putting them side by side and differentiating features. He calls the computer store to ask them questions that he cannot quite answer based on the instructions. He is evaluating the features and benefits, trying to figure out which will best help him achieve his desired outcome. He even makes a Saturday trip to Fry's Electronics and stands there for hours trying to get the different laptops to do things they are not currently enabled to do. He returns home with his information in hand, spends a few days researching some more and whittles it down to 2 laptops. Now Tom starts scouring the stores and sites for the best price he can find for the laptops that he has decided will fulfill he needs. His final decision between the two will be based on price and availability. A week or two might go by while he waits to see if it comes out on sale somewhere on the weekend. 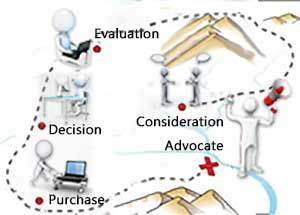 Traditionally the marketing expense is focused here at the decision stage and spread into the purchase stage. The goal is to grab them at the point of decision and pour on the influence to complete the transaction. It is fueled here by ads, PPC or Adwords most of the time to lure people like Tom into the decision at the product listing. He locates 'the one' and finally, the purchase stage! The marketing spend continues here even stronger, focusing Tom leading him to the conversion. Coupons, promos, multiple purchase deals are all techniques used to get the sale. End of the funnel and our story? No, it continues. Once the laptop arrives, actually before it even arrives, Tom just about pitches a tent on the brand website to learn how to use the features that are new to him. His goal, 110 mph on the information superhighway within 10 minutes of opening the box. Finally, his package arrives and sure enough, Tom has the product setup video playing on his other computer as he removes the new laptop from its' box and sets it up. Plug and play right? He wants to fire up right when he receives it and be on the information highway at full speed in minutes. Many times with a purchase such as this, we are left wondering if it is plug and play or is it really plug and pray.I know you can relate to exactly what I am saying. In Toms' case, no praying is needed because the brand went over the top with information on its website ensuring he had everything necessary to get things working perfectly in short order. The features do take a bit longer to set up, but Tom is happy with the walk through's, videos and helpfulness of the overall site. Success, Tom is cruising with his new laptop within minutes, the box and inserts from the box still spread out on the table around him. Sound Familiar? Engaging the different features available on the site, Tom was able to use all of the new features on the laptop and set them up just as he needed. The availability and accuracy of the information instantly makes the laptop his favorite, building trust and establishing loyalty. Several days later he receives a request, not a request for a review or please tell us how we did. Instead the request reads "Please tell us your story. Has your new laptop lived up to your expectations and helped you achieve your goals?" Everyone loves to tell their story. Why wouldn't he? Tom was provided not only a great product, but all of the information and tools necessary to use it and customize it to his needs quickly. It is the little things like this that set brands apart. Go the extra mile for your buyers. Raving Fans are your best asset. Tom wasn't left in the dark with an instruction manual in 6 languages but translated poorly. He has nothing but good things to say, and he most likely will show it off and tell his friends about the experience. Tom is now a brand advocate, a brand ambassador telling his story to anyone he thinks needs a laptop and plenty of people that do not also. 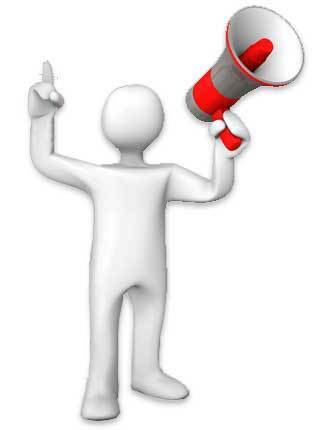 Raving Fans become your Brand Advocates or Brand Ambassadors adding incredible value and authority to your marketing strategies. Toms experience and his telling and retelling about his experience has more benefits than many months of expensive PPC. People are trained to skim past ads, but they will listen to a product endorsement or story from someone they trust. He has more power over their buying decisions than any PPC or ad. The traditional funnel focuses all of the spend on the decision and purchase. In this example, and depending on your product, it might not be the appropriate time. Savvy shoppers are heavily influenced in the consideration stage and spending more time in the evaluation stage. This shift warrants methods targeting different points in the customer journey. If you follow through and apply the concepts in the correct manner, your Amazon sales will not only increase, the positive effects of increased engagement at key moments will pay off as well. Social proof is more important than ever. People that know me in Amazon circles know that I don't ask for reviews and call them a negligible part of the process. I say that because I want to focus on driving warm traffic. If your product fits this example, you will see how we apply the importance of social proof at a different stage of the customer journey so when they get to the listing; they are going there already prepared to convert. Additionally, the goal is that you create a bonding experience for the buyer that makes them want to tell everyone about their experience on their own. I point this out often in different responses on different forums and groups discussions and can feel the people reading the statement and thinking, how would I accomplish that. In this example, the front-end marketing would be more effectively utilized at the end of the consideration stage as you transition into the evaluation stage. In the evaluation stage, you are comparing laptops side by side, going to stores or at least plenty of sites and narrowing down your choices to a final decision. Impacting and influencing the process here establishes influence as well as pre-sells the product. This warms up the traffic before they make a decision. The trust gained here ultimately should fuel the decision and help convert before they are ready to purchase. How can you influence this part of the funnel? Consider sponsoring ads targeted on comparison sites. Create a comparison site or a comparison post on your site of your product vs. the competitors. Then run ads pointed back to your page focusing on all of the brands compared and words like compare review, best, etc... Now you are benefiting from traffic for your competitors and might sway them to your product. Monitor the web for brand mentions, engaging the audience at every possible moment a user is happy while mitigating and handling any potential gripes or negative reviews. Ensure a process is in place to not just ask for reviews but to encourage the buyer telling their story and how the purchase event has impacted them. It also allows you to once again engage your audience and build your mailing list. Ensure that you use reviews and testimonials as posts on social media, possibly even as a sponsored post or ad. Engaging the potential buyer earlier in the process allows you to control the conversation, guiding them to the decision and outcome that you desire. Use these methods to raise buyer satisfaction and increase Amazon sales. These principles can be applied to any website, marketplace or platform and be very effective. Remember the average shopper has 6 to 8 touch points with a brand before making a purchase. Your goal is to have engaged and interacted with the potential buyer as many times as possible before, during and again after they make the purchase. Control the message and ensure that you are putting the right information in front of them at the right time. Begin the process with the strategies presented above. This is the pre-sell process, a trust-building exercise and brand building/recognition. You are indirectly leading them down the path to the desired outcome. You want them to to seek out your product as a hot prospect, arriving on your listing motivated and primed to convert. The more effectively you accomplish this goal, the less they will need to read your listing as they are aware of all of the points made already from the evaluation stage. Consider this a pre-emptive strike in your favor. This also helps to cover up any lack of Amazon reviews or price differences between your product and competitors as they are already coming to you. Stop waiting for a buyer to show up and hope your listing can convert. Manage your business and control the message from start to finish! This is a critical moment in the customer journey and buying process, influencing it for your benefit will pay back many times. 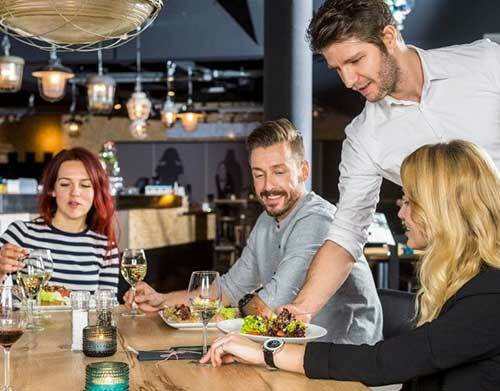 When you are in a restaurant, and the waiter drops the check for payment, a great waiter ensures your table is clean, everyone is happy, asks is there anything else you might need. They pay attention to you bringing the change right away. Why? Because at that moment you are deciding how much to tip them. Let's make a great impression, a memorable one. How many times has a waiter dropped the check and then disappeared making you wait and wonder why because you need change and everyone wants to leave! By the time he returns and then returns with the change half of the family is waiting outside. The sale itself does not end the Customer Journey. Is that the impression you want someone to have of you the moment they are deciding how much to tip you? I would hope not. Thank them for coming in, tell them you enjoyed the experience and invite them back. Make them feel like family, like they belong. It is no different than the positive influence that you can exert during the evaluation process, during and after the purchase. They have joined your tribe. Nurture your tribe and it will grow! A significant difference between an Amazon Seller and an eCommerce website owner is the ability and necessity to market and do SEO. Any Amazon seller that thinks their primary role is not as a marketer should accept the fact they will never make more than the average hobbyist. The days of set it and forget it on Amazon are long since gone. Just as a website marketer needs to run ads, drive traffic, engage their potential audience whenever possible with high quality content, so does any Amazon seller. Those that don't will find themselves eating dust in the coming months as a significant shift is occurring. Many of the new sellers just do not get that it is not a stall at the flea market. You must become a marketing pro and a content producer that creates content in support of your products. Break up your site content into smaller pieces distributing those snippets around the web and pointing it back at the main site, building back-links. Create high-value demonstration videos, detailed walk-throughs and all of the support needed so when a buyer receives their product they get questions answered. This brings us to the second spot where marketing spend should be focus. In the traditional funnel, it is targeted at the purchase itself, to get the actual conversion to occur. Let's look at this alternative method which will also pay off in other ways as you will see. Create high-value demonstration videos, detailed walk-throughs and all of the support needed so when a buyer receives their product they get questions answered. Remember the advocate stage? This is the equivalent of paying the tip, promptly receiving any change and walking out very very satisfied. So much so that the buyer tells others about it and recommends for them to go try it. How Do You Translate That To Product Sales? You want to be right there with the buyer, make a lasting impression, he will brag about the experience to friends beginning the process and kicking their funnel into the right direction. Tom will be the buyer that leaves the money review. The review that changes minds and helps sales get made. He is your raving fan! Remember back to our laptop example. Rather than just leave you hanging with a confusing instruction booklet, the website supporting the product contained useful videos, walk-throughs, training and assistance to aid you in setting up your purchase the best way possible and teaching you how to utilize all of the features. That is a solid investment in the future. Leaving the buyer with an incredible experience and creating a raving fan out of them. The tail end of your marketing spend that would normally be spent getting the conversion, instead is spent supporting the buyer through the entire journey while ensuring they maximize the benefit of the experience accomplished through what the product was purchased for. Remember you are selling the end result. People do not buy a chair because it has custom memory foam cushions. They buy the chair so they can relax and feel good after a long day at work. Don't sell the foam sell the relaxation and enjoyment. 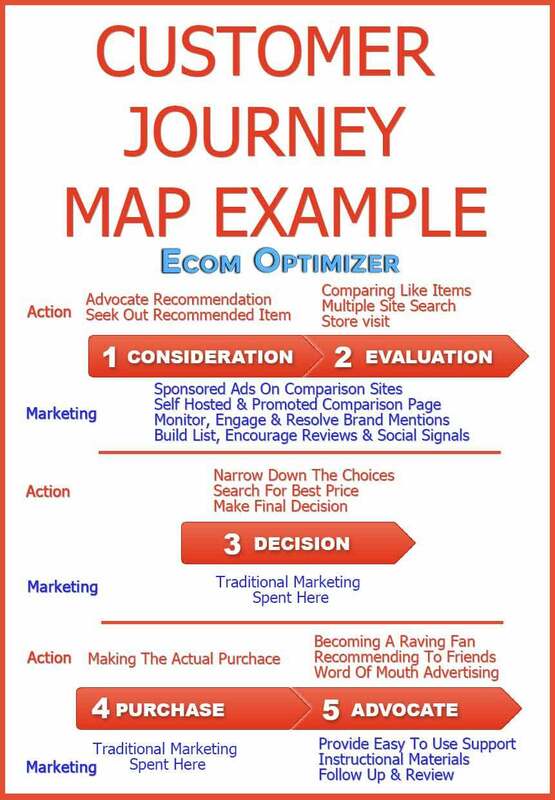 This customer journey map example is not a new concept, it has been discussed before often, but very few put it into play. This does not apply to all product flows; research needs to be done first to ensure it is a fit. Pay attention to your buyers journey as well as their needs. The 'Frequently Bought Together' feature on every Amazon Product page is very informative in regards to buyers needs and priorities. Even if you do not sell on Amazon, looking at the product listings on other platforms, reading reviews and so on, enables you to maximize the experience wherever you do sell. Pay attention to these types of features on the marketplaces as it is very informative about what your buyers needs are. Both of the items pictured here are accessories for the keyboard yet different brands and not sold by the kb seller. An eCommerce site owner generally will have multiple complementary products in just a few categories. That makes their lives much easier and their products much more natural to support than having 35 products in 34 categories. Would it hurt to carry many different brands of a particular item just to give your products more authority and selection? How about creating a separate amazon review site that is an affiliate site that reviews all of the laptops. Then if you don't get the sale, you still get a cut of the affiliate commission on your competitors product. Doing so also provides priceless data about the buyer and their preferences. Amazon itself does this all day long by selling on the site along side sellers and using the data to create now Amazon products.. This process changes your targeting strategy slightly. None of this will be successful unless you have a clear understanding of who your buyer is and have created multiple buyer personas to identify their needs that lead them on this journey in the first place. Traditional funnels target buyers closer to the actual decision/purchase point, but marketers incorrectly use smaller generalized keyword phrases in their targeting. This method targets buyers in the evaluation/comparison stage. It is actually more suited for long-tail keyword targeting as the buyer is right at the point of drilling down for product specifics. Learn our process for long-tail keyword discovery in this article. It is much better to control the discussion yourself than rely on some other review site. Then you can effectively deliver the right information at the right time during the consideration stage. This applies to any seller on any website or marketplace. It is not 1999, 2009 or even 2017. Survival depends on your ability to set yourself and your products above and apart from the countless competitors all over the web.